Hellooooooooo ladies!! I hope you're all having a good start to the week. I'm getting my blogging mojo back so expect more regular posting from me! I've been making regular trips to Chemist Warehouse lately to buy supplies because I stupidly burnt myself and of course I can't go past the (often random!) beauty bargains that they have there. One of the bargains I came across was the gorgeous Sally Hansen Complete Manicure in Parrot which was only $5!!! It's from the Sally Hansen for Tracey Reese Spring collection from last year which I don't think has ever actually been released here in Aus. Parrot is a beautiful grass green creme. Isn't it gorgeous and Spring-ish!! It applied really well and is pretty pigmented and dries to a glossy finish. 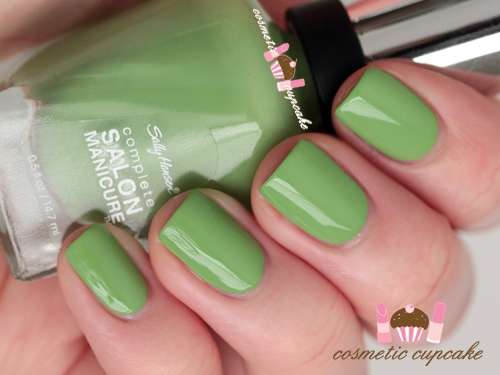 I think it'd make for a nice green apple manicure! 3 coats is pictured and I had to add a coat of Seche Vite to smooth over a dent lol. Details: I bought it for $5 from Chemist Warehouse but it was the last bottle at the store I went to and I haven't seen them at any other Chemist Warehouse stores unfortunately! Best to do a hunt ;) They had a few other shades from the collection but Parrot looked the most interesting. I couldn't agree more Melissa! Fingers crossed you find it Emma!! I really need to get my hands on Green-wich Village. I always walk past it but end up putting it down again! July, August and September 2013 hauls!